Charles Foust became superintendent of the Kansas City, Kansas, school district in June. Posted November 27, 2018 – When Charles Foust was named superintendent of the Kansas City, Kansas, public school district in June, he said he thought about his humble beginnings in Sedalia, North Carolina. Population then: under 600. His dad was a truck driver, his mom a homemaker. Neither went to college, but they encouraged him to get a degree. To help pay for a new car in college, Foust drove a school bus. “It means a lot to me to sit in the seat of superintendent. I don’t wear the position on my chest. I do the work,” said Foust, who earned an Ed.D. in professional leadership with a K-12 focus from the University of Houston College of Education in 2017. At 44, Foust is younger than most of his peers – the average age of superintendents across the country is 52, according to AASA, The School Superintendents Association. He’s also one of very few African-American superintendents – roughly 2 percent nationwide. Foust, a former principal and school support officer in the Houston Independent School District, now leads a district with similar demographics. Nearly 85 percent of his students are economically disadvantaged, and most are students of color. “If we don’t do what’s right by kids, I know the alternative,” Foust said. In his few months in Kansas City, he’s moved some of the district’s instructional coaches from central office to the schools and plans to shift the most effective to the neediest campuses, according to a recent article in The Kansas City Star. He’s striving for every student to show at least 10 percent academic growth annually. Foust said he always knew he wanted to be a teacher, but it took him awhile to accept it. As an undergraduate at North Carolina A&T State University in Greensboro, he started with a double major in education and nursing. He said his dad worried he’d struggle financially as a teacher. “But I love teaching,” said Foust, who went on to teach elementary school for five years in the Guilford County School District in North Carolina. Foust then earned a master’s in administration and supervision from the University of North Carolina at Chapel Hill and found his passion for school turnaround work. 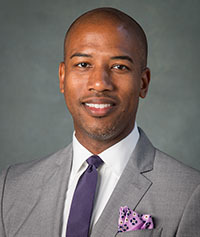 He did his internship at a low-performing elementary school, served as a middle school assistant principal and was promoted to principal of Brooks Global Studies, an elementary magnet school in Guilford County. In 2010 Foust moved to Houston to serve as principal of Fondren Middle School, part of HISD Superintendent Terry Grier’s reform program. Under his leadership the school met the state’s academic standards, exceeding the student achievement target of 50 points by 11 points in 2013. “Wow, we worked nonstop over there,” said Foust, who was promoted to supervise a cluster of HISD schools after three years as principal. When Foust left North Carolina for Houston, he was well into a doctoral program that he couldn’t continue from afar. He wasn’t sure he’d ever finish but Grier reminded him of his ultimate goal. “He said, ‘I thought you want to be a superintendent,’” Foust recalled. “Not if you don’t have your doctoral degree,” Grier quipped. Foust said his oldest daughter also called him out when he said he had never quit anything. “What about your degree?” she asked. 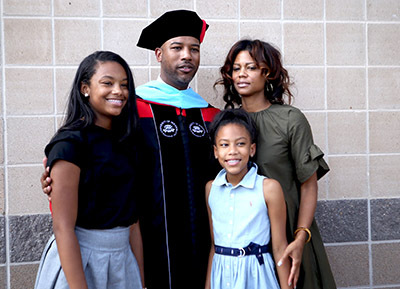 Charles Foust celebrated his 2017 graduation from UH with his wife, Sherelle, and two daughters, Kennedi and Brooklin. So, in 2015 Foust applied to and was accepted into the UH College of Education. With some classes transferring, he graduated in two years – 13 years after first enrolling in the doctoral program in North Carolina. His wife, Sherelle, and two daughters, Kennedi and Brooklin, joined him at the ceremony. Foust praised the relevance of the workload and the bond among his fellow classmates. After earning his Ed.D., Foust was recruited back to North Carolina to serve as the chief school performance officer for Union County Public Schools. Associate Professor Bradley Carpenter, who oversees the school leadership graduate program at the UH College of Education, said he wasn't surprised when Foust was selected for the superintendent's job in Kansas City, Kansas. "I was elated," Carpenter said. "I knew he would be a superintendent of a large school district somewhere in the United States. I think he's probably the perfect person for that context. It's got significant challenges, but his history of going into places with significant challenges and motivating people to do their best for kids stands on its own." For his part, Foust said the nearly 20,000 students in his district keep him grounded. “I have a student Superintendent’s Council, and those high school students tell me what’s working, what’s not working and how do we get better,” he said.